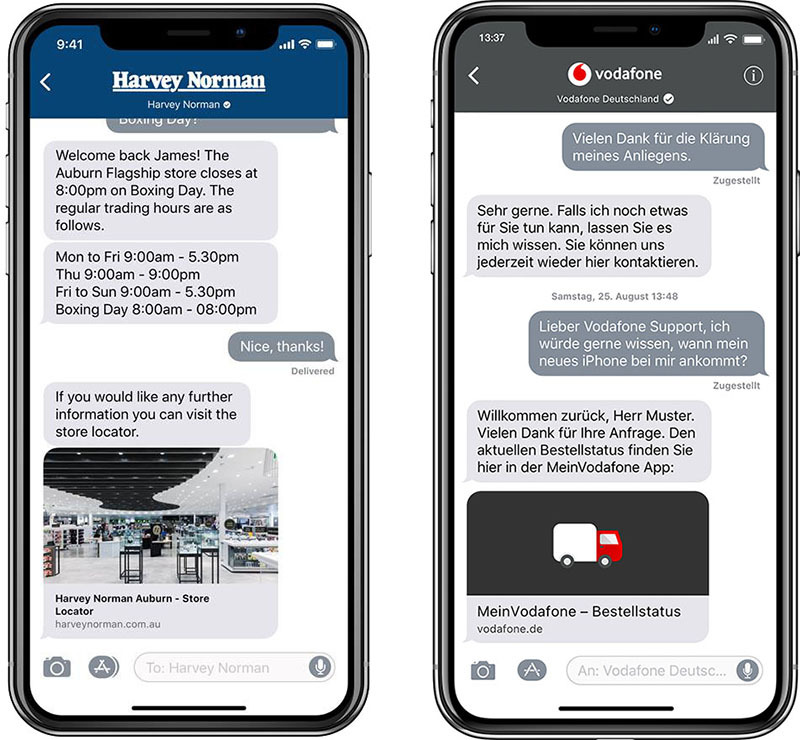 Apple Business Chat, a platform for businesses to provide customer service through iMessage, is now available in Australia, Canada, France, Germany, Hong Kong, Italy, Singapore, Japan, Switzerland, and the United Kingdom. The feature launched in the United States earlier this year. The international expansion coincides with 30 additional businesses adopting Apple Business Chat around the world today, adding to 15 brands in the United States that have been using the platform, which remains in beta. For example, luxury fashion brand Burberry is integrating with Apple Business Chat worldwide to enable clients to check availability on items nearby, ask questions about the size and fit of clothing and accessories, and get help placing an order. Customers can also inquire about special events like fashion shows. Hotel chain Four Seasons is expanding its adoption of Apple Business Chat to reach 88 properties across the globe with Four Seasons Chat's capabilities to communicate with real people at each property in more than 100 languages, with response times averaging 90 seconds or less. Apple Business Chat launched in iOS 11.3 in March, enabling iPhone and iPad users to ask for information, schedule appointments, make purchases, and complete other customer service tasks directly in the Messages app. Business Chats must be initiated on an iPhone or iPad, but they can be continued on any other iPhone, iPad, Mac, or Apple Watch signed into the same Apple ID. You can start a conversation by searching for a business in Maps, Safari, Siri, or Search and tapping on the Messages bubble where available. Other brands using Business Chat include Apple itself, DISH, Aramark, Four Seasons, Harry & David, American Express, Discover, Hilton, The Home Depot, Lowe's, Marriott, Newegg, T-Mobile, Ameritrade, Wells Fargo, and 1-800-Flowers. Business Chat requires iOS 11.3 or later. Also note that while the feature has expanded to additional countries, availability varies by brand. For example, when we tried to message Apple through Business Chat in Canada, an automatic reply indicated that the feature remains unavailable in that country. Update: This article has been updated with additional information from Apple's announcement. I still haven’t he slightest idea how to use this in the U.S. Thanks for posting that. That is really, really unintuitive. Never would have thought to look in Spotlight. I stay at Marriotts almost weekly and could never figure out how to use this to contact them. And it's even worse if you read [USER=893553]@LandRovers[/USER] post above yours. It would be better if you could search the business name right from messages. E.g. Home Depot → Spotlight search for "Home Depot"
Dish → Spotlight search for "Dish Network near me"
My apologies for the initially patronizing response. It seems to work with Home Depot (I searched with Spotlight and tapped the chat bubble under the "Business" result), but it doesn't show up when I type "Dish" into Spotlight. One thing to consider, Home Depot, Lowes, T-Mobile etc have iMessage extensions so its easier to message them without having to search etc. Amex I dont have an Amex card so I cant verify, but I do see there is an iMessage extension so it may work. Text a business instead of calling it. That is one solution, but I really don't want to have to have an app for every retailer I visit IRL. Apple has done a very poor job in communicating how this should be used or how to find "handles" for the retailers. Just like they're doing a bad job at communicating at how Shortcuts works. They come up with some great stuff, but if people don't know how to use it and it doesn't surface well, its just kludgeware. I wonder how many people will accidentally end up sexting businesses? No, I mean I can’t figure out how to actually do it. Say I want to chat with Dish. How? It says “search in iOS for dish.” I tried that. Doesn’t show up. I search “Dish Network near me” in either spotlight search or Safari, and the option appears that has their website, a phone call button, and a messages button, which should initiate the Business Chat. “Near me” was needed, as it doesn’t show up without that.